These days we hear about the youth movement in climbing big mountains; setting records and motivating others to get off the couch however we rarely hear about that steady hand climbing along with them providing encouragement, nurturing and a watchful eye. This silent partner most likely avoids publicity, focusing the attention on their son or daughter as they follow their dream. In 2010 I covered 12 year old Matt Moniz as he set a High Pointer record by standing on the highest point of each of the US 50 States in under 50 days. And, he was not alone. His dad Mike was with him on every climb from the lowest in Florida to the summit of Denali. There is an excellent documentary brief about their project by Ben Thomas entitled “Pushing Above the Highpoints“. It will put a smile on your face! 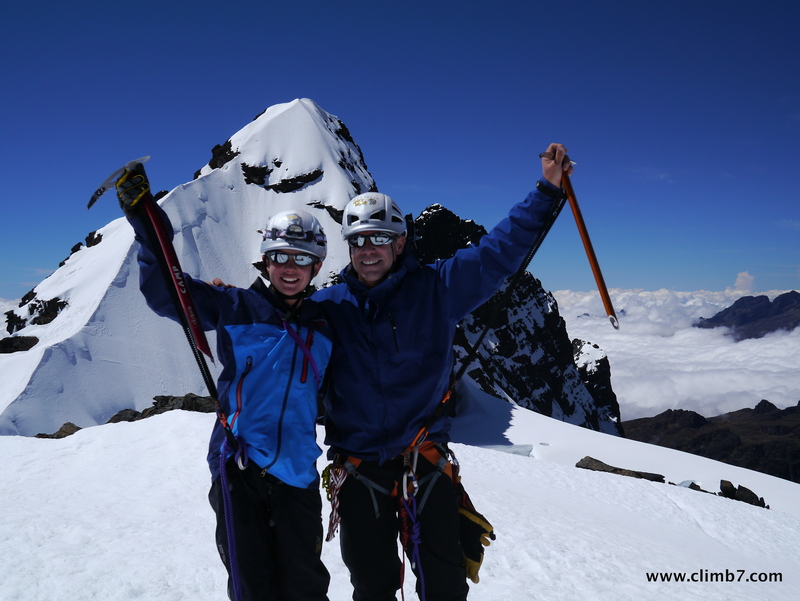 They both continue to climb today, including a recent tour of the highest in Bolivia. Now Mike is setting out on his own for a few climbs this spring – Everest Lhotse and Cho Oyu – all in one push! Remember Mike is not a guide, he is a regular father with a real job so attempting three 8000m peaks during the same expedition is ambitious. And his highest thus far includes Aconcagua, Denali and Kilimanjaro among others; none over 7000m. Mike is no ordinary climber. In getting to know him, Mike is a case study in preparation, training and is approaching this project with a meticulous attention to the details. Not content to simply tag a summit, he is a self-described “speed climber”. I’ll let him describe what that means. Mike is climbing the south side of Everest with IMG and hopes to summit Lhotse immediately after his Everest summit before moving to Cho Oyu on a private climb with Charley Mace who also be on Everest but attempting the very difficult West Ridge with a team from Eddie Bauer/First Ascent. Thus both climbers will be acclimatized and should able to make a quick push up Cho Oyu. Not be left out, Matt is going back to Everest Base Camp with his twin sister and a few classmates this year. Q: First up, let talk about your 13 year-old son Matt with whom you set a record for summiting the US 50 Highpoints in 2010. How is Matt these days, any recent climbs? Matt is doing really well – his latest climbing project was in the Bolivian Cordillera Real, attempting three 6000-meter peaks in 6 days, summit to summit. Always thinking ahead he’s been studying his next Seven Summit looking for a possible “first ascent” or something “ambitious”. I’m not sure what he has in mind but he’s creative. This summer he’s planning a trip to Spain to connect with his climbing hero Chris Sharma for some rock climbing and Spanish lessons. When he’s not climbing Matt is a passionate advocate for encouraging youth to get outside. Matt is active as an Ambassador for Outdoor Nation and is currently working on a podcast series about great adventurers called SPARK! This May he’ll be releasing a book with National Geographic School Publishing that teaches grammar school children about the geography of the US through a diary of his 50 State High Point Expedition. Q: Mike, you have set an ambitious goal of three 8000m climbs in one push: Everest, Lhotse and Cho Oyu? Why three and not just bag one like a “normal” person 🙂 ? Alan, I recognize this is an audacious goal, but I really enjoy the complexity of multi-summit climbs. In a way, they’re like the mountain equivalent of a Rubik’s Cube, a real-life three-dimensional puzzle. It could also be a coping strategy to keep me from fixating on Everest. Q: You consider yourself a speed climber. What does that mean and what motivates you to climb fast? My guess is that when people think of speed climbing Ueli Steck and his three-hour climb of the Eiger’s North Face or Hans Florine ripping up The Nose of El Cap first come to mind. That’s not exactly my style of speed climbing. Our focus has been on multi peak/multi day climbs where speed is measured in days or weeks and success is summit to summit. Most recently we attempted three Bolivian 6000 meter peaks in six days. We almost succeeded, but one of the team came down with a fairly nasty stomach problem so we opted for Illimani (6438m) and Huayna Potosi (6088m), Pequeño Alpamayo (5370m) in 6 days. During the summer of 2010 Matt and I climbed each state high point beginning with Denali in just over 43 days, a new “speed” record. Before that it was fourteen, 14,000-foot peaks in fourteen days, actually eight days. By now you may be noticing a pattern. Alan, I’m not completely sure what motivates me to pursue the multi peak adventures. As you well know, given your recent Seven Summit Adventure, when you do challenge yourself with seemingly impossible goals sometimes all the stars align (weather, health, training, team) and it works. Other times it doesn’t but you still walk away a better version of yourself and accomplishing 90% of the impossible is nice too. Q: Everest first, then Lhotse within 24 hours. Then on to Cho Oyu? Are you concerned that you will be climbing it as the monsoons traditionally startup in early June? It’s probably to consider this expedition plan through a utopian lens. Assuming that many of the interdependent variables coalesce positively, it could be done. And, yes, without a doubt, I’m concerned about the weather window. The beauty of the expedition is that it’s fluid; in addition to the weather and my own ability to acclimate, there will be timing issues around logistics on Lhoste, like fixed lines and again, the weather. I’ve been coordinating with Eric Simonson and will continue to his advice and guidance on how to structure all these elements so that they can flow together in a way that allows maximum success given the specific circumstances. Q: Given the extreme physical nature of your climb, are you doing anything extraordinary in your training? When possible most of my training is in the mountains. August in Bolivia was a great training ground: high, technical and sustained. Since then I’ve been on a six-day a week schedule, which includes varied aerobic work and weight training. Here in Colorado I try to get out for long, three to seven hour, ski mountaineering excursions at least three days a week. Always with moderate weight in my pack, my friends like me. Berthoud Pass is an ideal conditioning venue for me. In almost any conditions I can get to the ridge of the Divide (12,200 ft) in less than an hour. Fortunately, the prevailing winds buffet the ridgeline leaving just enough snow to skin along but free of any significant avalanche danger. On a good day I can log several miles at 12-13K feet. Here are a few examples from my Garmin Connect. While I’m out I like to target about 70-80% of my maximum heart rate, Zone 3, which helps increase mitochondrial density and stroke volume and should help me make the most of the limited oxygen up high. At home I have an inclining elliptical trainer and fluctuate my workouts between high and low intensity. A favorite show to watch during my sessions is “Everest: Beyond the Limit.” Besides being entertaining it’s helpful to study the route and just generally pick up on the nuances of the climb. I enjoy reading as much as possible about training tools and strategies. One new device I’m trying is a Powerlung, an instrument resembling an elaborate kazoo, which claims to improve pulmonary function. We’ll see, but for the five minutes a day it takes to “workout” I can’t see any downside. At least I’ll be able to inflate my sleeping pad faster. Q: You are participating in a unique hi-resolution brain scan before and after your climbs to measure the effect of high altitude on the brain, please tell us more on this. If you’re a high altitude climber it hard not to wonder what potential damage structurally and cognitively you might be subjecting your brain to in these extreme environments. Many in the climbing community read the 2006 MRI based Spanish study that asserted a link between high altitude mountaineering and brain damage. The limitation with MRI is that it measures the structure of the brain, but not its function. So while insightful I’ve been especially curious what the functional impact might be on the oxygen-starved brain. During March of 2012 and then post my Himalayan expedition I’ll be undergoing a type of brain imaging called SPECT. SPECT measures the functioning of the different regions of the brain. In addition to the SPECT scan the results will be analyzed by extremely sophisticated software from a company called CereScan. The combination will offer an unprecedented look at the function of a pre and post 8000-meter brain. Hopefully, in the future the utilization of imaging tools like SPECT and Cerescan will allow climbers to make educated decisions. Offering them valuable, objective, measureable information about the changes that occur in the functioning of the brain as a result of high altitude exposure as well as information about how well their brains heal. This would allow climbers to make informed decisions about the type and frequency of the risks they want to take. Knowledge is power – more is better. Q: Matt is going to Everest Base Camp along with you, but for a special cause. Would you and Matt tell us about it? In March Matt will be co-leading a group of teens (eighth-grade girls and boys, including Matt’s twin sister Kaylee) from Boulder to EBC. He’ll be teaming up with longtime friend Tak Man Rai, Matt’s Sherpa who accompanied him to Everest Base Camp when he was nine. As you can imagine, they’re both very excited about the Nepal reunion. Prior to the Everest Teen Team’s departure they’ll be working with the American Himalayan Foundation to raise awareness and funding for their program to “Stop Girl Trafficking”. The problem in Nepal is significant. It is estimated that over 20,000 girls are trafficked a year from Nepal. Remarkably, just $100 keeps a Nepali girl safe and in school for one year. Each one of the team plans to secure at least $1000 in pledges for their EBC Trek. 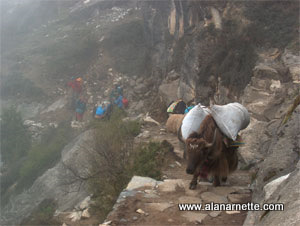 Along the way they will be visiting the Khumjung School for a learn-and-share. What a great opportunity to experience the grandeur of the Himalaya while contributing to the well-being of the people who make it their home. Wish us well! And, I’m looking forward to sharing updates on my expedition and the Everest Teen Team progress with you and on our website . Thanks Mike, and Matt. We will be following both of you on your blog. Matt keep up your great work and being a role model for youth. Mike, wishes for a safe trifecta of 8000m peaks! Hopefully we can do a follow-up interview upon your safe return. Alan, I followed your journey last year and I adore that your updates will continue. Mike, looking forward to tracking your adventure and reading your dispatches. Thanks Johanna. Will be following Mike and all the other Everest climbers this year from Colorado but with them in spirit! As fascinating as the updates about his climbs will be, I’m even more interested on the information they get from his brain studies. I’m sure you are as well Alan. I cant wait to follow your updates this year, I wish it would hurry up and get started! Thanks Lori, that is a high compliment from you – being an inspiration to everyone with MS. Mike and Matt are a great combo and will be exciting to follow Mike’s triple climb! That will be some adventure to hopefully summit Everest, Lhotse and Cho Oyu in one push. I wish you all the very best Mike and I will look forward in reading your dispatches.